Heading to a concert and looking for a rocking wardrobe? Wise Guy on Brigade Road will sort you out. Their tees begin at just INR 595. A hit with metalheads and rockstars in Bangalore, Wise Guy is the perfect place to put together a rockin’ look for your next gig. 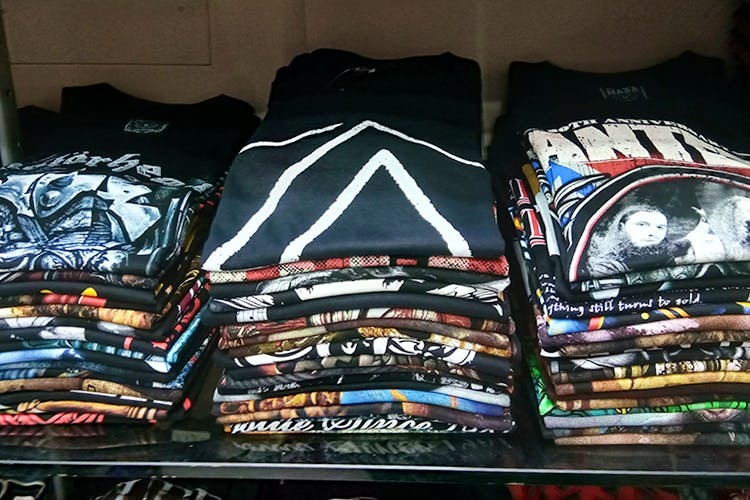 Located on the first floor in 5th Avenue, Wise Guy is where you go to pick black tees imprinted with your favourite band. The largish store has racks filled to the brim with tees done up in bold prints and graphic novel-like designs — many of them reflect the album art style associated with the band itself. They have everyone from Aerosmith to Metallica, Slayer, and Nirvana. Slipknot, AC DC, and Megadeth make an appearance too. And while these are not original merchandise, you can expect your tees to come with a dose of nostalgia since these designs were all the rage in Bangalore during the 90s. Wise Guy also stocks a bunch of superhero-inspired tees. Again, these are not original but if you want to go to bed feeling like a hero, these will make for comfy nightwear (prices start at INR 595). You can even sign up for boxers and PJs with Spidey’s face and Batman’s signage. There’s also a rack of badges (INR 60 each) and keychains featuring rock and pop culture icons. While they say the prices are fixed, you can always bargain and get a better deal!